Land: It is assumed that land is already owned by the grower as that is the most common practice. Open land itself may be valued at $1,500 per acre. Open land in Chautauqua County is valued at $800 – $2,000 per acre for agriculture purposes. Annual ROI on this investment could be as little as $45. Vineyard layout: Spacing is assumed 7×9 or 658 vines per acre. Tile drainage: While tile drainage is not required on soil types most well drained soil already has an established vineyard. A common tile drainage system would include 4″ pipes at 18′ spacing with an 8″ mainline. Trellis system: 220 4″ pressure treated posts per acre as well as 35 end posts and anchors per acre. Wage Rates: Wage rates reflect the actual costs of growers of $12 per hour for unskilled labor. Piece rate wages for pruning are assumed at .3 per vine. Harvest and Hauling: Grapes are assumed harvested and hauled by the owner operator at a cost of $120 per acre. Machinery: Machinery depreciation was estimated at a discounted rate based on the assumption that economies of scale will reduce per acre depreciation costs for new plantings. Overhead: Similar to machinery, overhead costs should rise as the grower expands holdings but per acre costs should fall. The overall savings are captured entirely in the new planting acreage and estimates of new overhead costs are included. Cost of Capital: A 2.5% interest rate change on capital investment and operating capital was changed. This rate represents a real rate based on a six percent nominal rate of interest and an expected rate of inflation of 4%. Yields & Prices: Revenue is displayed as a matrix as fluctuations in yield and price will continue to be volatile. We could estimate an average, but you will never have an average year. The revenue matrix illustrates the floor, ceiling and expected revenue the planting may have. 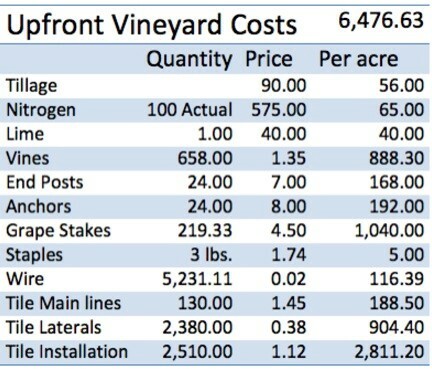 The good news is, the cost of vineyard establishment does not impact the cash flow as dramatically as the total cost of the vineyard does. Establishing a vineyard will normally increase unpaid labor costs quite substantially. Most of the establishment labor is either low-skilled labor or completed by grower owners and family. Even with this competitive advantage, it often makes more sense to purchase an existing vineyard. Realizing the benefits of a new trellis, new vines, and orderly planting simply take far too long to justify any interest charges. Even any reasonable ROR will likely be greater from purchased vineyards, rather than newly planted vineyards. Tile is a significant variable in vineyard plantings. Growers have experimented with plowing tile in to reduce such high installation costs.These costs clearly illustrate why most well drained soil already has existing plantings. Planting on well drained soil could result in establishment cash outlays as low as $2,600 per acre. Also, at $3,900 per acre this cost should be one specifically targeted by the grower.Negotiate with the installer, entertain more efficient installation methods, and properly assess exactly how much drainage the site requires. Establishment labor and maintenance until cropping begins will increase those costs, but could potentially result in less expense than a well-drained gravel site with an existing planting. Total labor for trellis construction, planting, and fertilizer application is 16 hours. Cash outlay for that labor will vary between $250 per acre and $80 per acre. For a large grower with a salaried employee costs could be lower as much of this additional labor can take place outside of the normal growing season. While planting costs vary, even if expenses are comparable to existing plantings, it can make economic sense to plant. Minimizing unproductive land along with the upkeep and taxes associated with that land improve efficiency. Macroeconomic conditions make this a particularly interesting time for investment. Money is generally this cheap two or three times a century. Credit requirements are tight but for those with capital a reasonable return on investment (ROR) in a long-term investment is not available. The Federal Reserve continues to manipulate long-term rates to encourage investment. Thirty-year notes currently yield 4.55%, a mere 2% above long-term inflation. Given current inflationary pressure, actual yields could easily average 1%. Ten-year notes currently yield 1.82%. Actual rates could easily fall below 0% if the economy recovers before 2016. Historically the major concern with expansion was that the grower would use a great deal of capital for a ROR that could just not compete with the market. At this time the ROR in the market looks downright awful. Anticipating negative yields over the next decade is not at all a stretch.